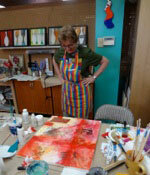 LOCATION: ARTspot Studio - located in the back room of ARTspot, 408 Main Street, Edmonds, 98020. SUPPLY LIST: You can purchase all your quality art supplies at ARTspot. Registered students receive a 10% discount on all their art supplies during the course. All items on this list are available at ARTspot. I ENCOURAGE experimentation, so a variety of supplies is welcome. 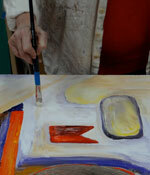 I strongly encourage you to use artist quality paints - I use Golden paints as the pigments are pure and bright. Questions or info about these supplies? Feel free to email Tracy at ARTspotEdmonds@gmail.com. Any one of our ARTspot staff members would be happy to answer questions and/or set aside what you need so you are all ready for class. 425-640-6408. You can use a rectangular Tupperware type container with lid or can purchase a sealing palette for acrylics to keep paints from drying out. We recommend the Artelier Airtight Peel-Off Palette. A variety of Gel Mediums and Molding Pastes: these are super versatile: regular or heavy gel & molding paste.